This photograph, taken at the Phaeno Science Centre in Wolfsburg, Germany, shows a young woman carefully walking on a tightrope strung between two buildings. A pretty typical piece of advice for someone with a fear of heights is, “Don’t look down!”. In this case, however, the woman should have no trouble staring down at the scene below her. 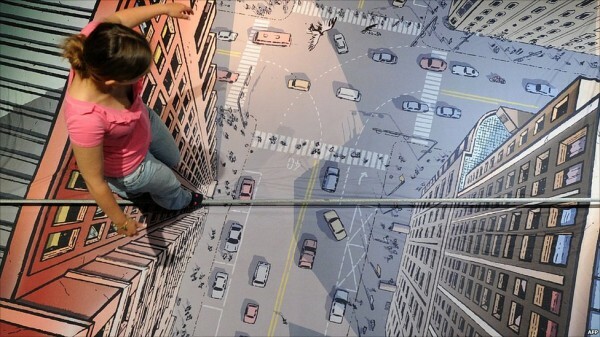 The buildings, street and cars are all drawn on a flat surface using a trick of perspective to give the illusion that she is high in the air. 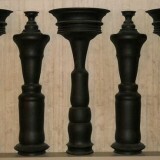 The position of the camera (i.e., above the young woman) further enhances the illusion of depth.